When then-President Barack Obama announced the gradual re-establishment of US–Cuba relations in December 2014, it was heralded as a historic breakthrough in the two countries’ icy affiliation. Dubbed the ‘Cuban thaw’, the agreement relaxed a number of trade and travel restrictions on US citizens travelling to or investing in Cuba. The thaw had an immediate effect on tourism in the small island nation: between January and May 2015, the number of Americans visiting Cuba for leisure was 36 percent higher than figures for the previous year. Dr Stephen Wilkinson, an expert on US–Cuba relations and a lecturer in politics and international relations at the University of Buckingham, noted that, at the time, “the number of American visitors became the largest of any national group to the island”. This progress, however, was short-lived. In November 2017, at the end of his first year in office, President Trump announced an abrogation of Obama’s normalisation policy, calling it “terrible and misguided”. Trade and tourism restrictions were once again tightened to prevent individual US citizens from travelling to Cuba, while restrictions were also placed on US firms seeking to invest on the island. Trump’s policy has divided opinion, with some arguing that it is a petulant, politically motivated protest against Obama that deepens the restrictions placed on Cuba’s already struggling economy. Others, however, have suggested that it could be a blessing in disguise, as it allows the island nation to retain the vibrant culture for which it is so well known. After all, Obama’s shift in foreign policy did not just give US citizens the right to travel there – it also opened the door for businesses to move in and take advantage of the growing tourism opportunities on the island. For example, in March 2016, the hotel chain Starwood became the first US company to sign a deal with Cuba since the 1959 revolution by agreeing to manage two hotels in Havana that had previously been under the control of the Cuban Government. In August of the same year, JetBlue became the first US commercial airline in more than 50 years to land a flight carrying American passengers on the island. As such, the concerns surrounding corruption were rooted not in an influx of American tourists, but in an influx of American businesses on the island. Regardless of the legitimacy of these apprehensions, they never came to fruition due to Trump’s rescindment of bilateral relations in November 2017, which closed the doors to Cuba for American businesses and tourists. While it may not have been Trump’s intention, the policy had the effect of safeguarding Cuba from further American influence, allowing its unique national identity to endure. 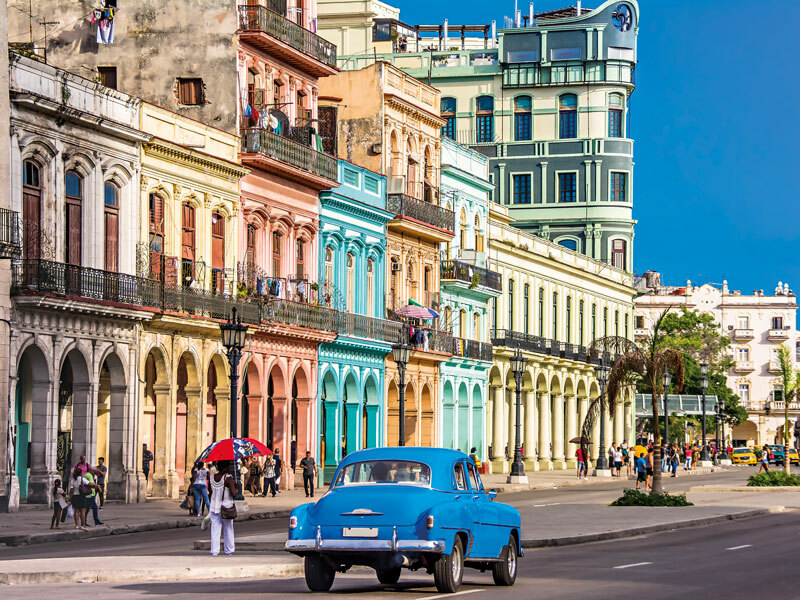 There’s huge touristic value in Cuba’s reputation as an untainted destination, predominantly in its total opposition to other increasingly homogenised locations across the globe. Many modern cities are filled with a familiar handful of big brands, leaving little space for local independent traders. Cuba’s isolation from the rest of the world may have a clear cultural benefit, but the economic picture is far less rosy. The US embargo has hugely restricted the Cuban economy since its application in 1959 – Wilkinson told Business Destinations that “it amounts to something like 10 to 15 percent of GDP per year, or $260bn since 1959, according to the Cuban estimate”. Unable to trade with the US, Cuba has turned to nearby countries such as Venezuela for subsidies, which currently account for around 20 percent of its GDP. In recent years, however, Venezuela’s economy has been plagued by hyperinflation and oil price fluctuations, leaving Cuba with an unstable primary benefactor. Without the embargo, “Cuba would fly economically, there’s no doubt about that”, according to Wilkinson. The country has a highly educated population, with more graduates per capita than any other nation in the Western Hemisphere, said Wilkinson, along with a world-class healthcare system and biotechnology sector. It also benefits from a range of valuable raw materials, including oil reserves in the Gulf of Mexico and strategic minerals such as nickel and cobalt. By lifting the restrictions, the US could take advantage of all of the factors that make Cuba a prosperous trading partner, as well as a lucrative destination for American businesses to set up shop. At the moment, the US is cut off from those possibilities. Of course, Cuba itself would see huge benefits if the embargo was lifted, as it would be able to seek investment from US sources to boost its national infrastructure. “It’s a developing country, it suffers from capital shortage, and it needs capital investment,” said Wilkinson. Under the embargo, it’s illegal for Cuba to use US dollars, which not only cuts it off from US investors but also from lending institutions like the IMF and the World Bank due to the US’ powerful influence on those bodies. As such, Cuba is forced to turn to private banks to borrow money for development projects – but, according to Wilkinson, “private banks are so scared of the embargo that they won’t lend [to Cuba], or if they will, they want to charge very high rates of interest, so it means that Cuba can’t afford to borrow the money”. Occasionally, the island will turn to other governments such as China or Vietnam, but the stars don’t always align with regards to the availability of funds or a willingness to lend. As for Cuba’s iconic cultural identity, maintaining that is certainly possible in the face of an influx of American business. However, for better or for worse, under the current US administration’s obstructive foreign policy, no such US–Cuba relationship seems likely to develop any time soon.